Not long after season two of Netflix’s Hemlock Grove was released, our esteemed editor in chief Paul Brian McCoy sent me an e-mail asking if I was still on board to review the season for Binge/Purge. He was doing his due diligence, but it was a reasonable question, given that I’m a new parent, and taking care of a four month old eats up a lot of time. Despite the potential time crunch, I figured I could binge and purge to the necessary extent. A few days later I sent him another e-mail informing him that I was on pace to get through the series in time to write a review for it, and that my time crunch was not the biggest obstacle in my way. No, the biggest obstacle in my way was the quality of the show. Squeezing in episodes while my son was sleeping would have been so much easier if the episodes were actually any good. 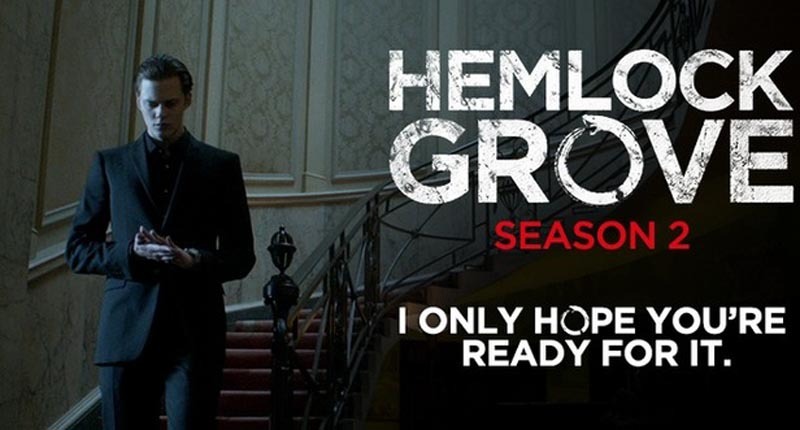 That’s not to say that season 2 of Hemlock Grove is across the board awful. It’s not. But it’s more bad than good, and I say that as someone who kind of liked the first season. Some background, then: I thought the first season of Hemlock Grove was bizarre. I think it was trying to be about five different things at once (Twin Peaks, Twilight, True Blood, an actual horror show, and a reasonable adaptation of its source material) and it didn’t quite succeed at any of them. But it was just strange enough for me to enjoy it, perhaps because it failed to be any one thing. The first season also managed to keep my attention because it had some mystery to it. Having vampires on your show means nothing these days. What matters is the mythology. Everyone has a vampire story, and every vampire story has its own mythology. That’s what makes them interesting. They’re like snowflakes. And I’ll admit that I enjoyed the Hemlock Grove take on werewolves. I like the fact that Peter the Wolf (I see what they did there) doesn’t turn into a wolfman, but just a wolf, and that wolf is literally inside him, waiting to bust out (again, literally). I even like that the wolf devours the remnants of Peter’s human form before moving on. I mean, if it didn’t, people would start to wonder why they keep finding bits of Peter in the woods every month. Hemlock Grove made it through a first season by putting a new spin on some old standards, which is by and large why the second season is such a failure. There’s nothing new here. There’s only a gross misunderstanding of what made the first season any good. In fact, the entire season seems to be set up for a third season, which is not a successful formula for a second season. As the season opens, Peter the Wolf has ditched Hemlock Grove to roam the world with his gypsy mother. Unfortunately, the cops have something to say about that, as they arrest gypsy mom and Peter is forced to hang out in Hemlock Grove with his cousin for a while longer. He’s also having some crazy dreams that seem to interconnect with the dreams his totally-not-his-boyfriend Roman the totally-not-a-vampire is having. Maybe they should talk. They’re ultimately brought together by Miranda, a young woman trying to get to California who is run off the road by persons unknown. She ends up at Roman’s doorstep and he invites her to stay with him because that’s a thing people do when they’re filthy rich vampires. She agrees because that’s a thing people do when they’re not very bright. Miranda meets Peter because he’s now working at the garage where her car is being fixed. And just like that, she’s involved in the craziness that surrounds the werewolf and the vampire – and the vampire’s daughter, who he’s been hiding from everyone. And who can blame him? The mother was his cousin who he impregnated in her sleep. Miranda, Peter, Roman, Peter’s cousin Destiny, and Destiny’s new secret assassin boyfriend (seriously, they don’t say that’s what he is, but in the finale he’s running around with a silencer, so, you know) face off against some crazy religious types who are killing children. Roman’s daughter, Nadia, ends up on their list. The B plot is the return of Roman’s mom, Olivia, who seemed to be dead at the end of last season, killed by Roman himself. She’s recovering nicely. She had her tongue ripped out, but it’s been reattached and, conveniently enough, changed her awful British accent to a Midwestern one. She’s also started to humanize, which is an interesting angle, but it’s reversed by the end of the season. There’s a storyline involving a castrating drug dealer that has no place on the show. I have no idea why it’s there, other than to give Destiny’s secret assassin boyfriend someone to kill. But that happens so quickly — and in the finale — that nothing comes of it. There’s a moment in the middle of the season where I thought something really cool was happening. One of the mysteries of last season involved “Project: Oroboros,” the top secret experiment going on in the Johan “mad scientist” Pryce’s lab. It involved creating a new body and transferring someone’s consciousness into it. There’s a moment when Destiny, who has mystic abilities, touches Miranda and has visions involving a snake, one that’s seemingly been hurt somehow. Well, an Oroboros is a snake devouring itself. So I figured Miranda must be connected to the project. Add to that the fact that Nadia’s mom, Letha, was in the Godfrey building when she died, and Dr. Pryce presided over her in her final moments, and suddenly I began to form a theory. Why would Miranda suddenly be lactating and feeding Nadia? Why would she show up at Roman’s door, of all places? Why is she attracted to Letha’s old boyfriend, Peter? Maybe because she is Letha, reborn in a new body, but not aware of who she really is. I kept watching with the idea that this was the case and was, of course, sorely disappointed when the truth involved some kind of snake monster — a snake monster which flies off with Nadia at the end of the season, because this is all set up for a theoretical season three. Unfortunately, I can’t imagine that I’ll be watching to see what happens to Nadia or any of the others. This season was aimless and padded, and in the end, kind of pointless. Any potential I saw in the show after the first season was gone by the end of the second.